We give you some expert tips on becoming a micro gardener. Cooking’s an even greater thrill when you can pick juicy carrots, plum-red tomatoes, crunchy lettuce or fresh herbs for the pot right outside your back door. Our desire for fresh, homegrown fare has seen many of us grow kitchen gardens in the smallest of spaces. Luckily, a garden the size of a small table can provide for the dietary needs of a family of four – and it’s possible to grow something for the pot all year round without too much hassle. 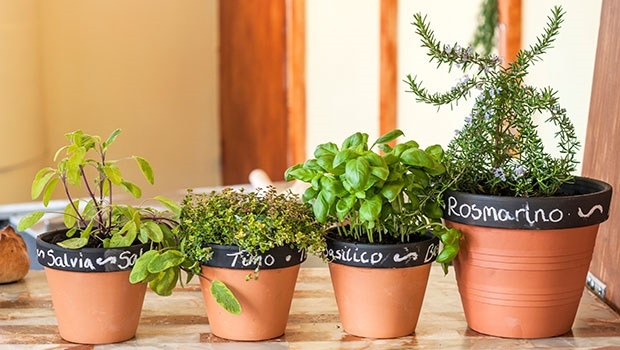 Most kitchen gardens start with a potted herb or two, and grows from there. These four eco-friendly practices will ensure you reap healthy harvests. Don’t plant the same crops in the same spot, year after year. Rather, divide the vegetables into three basic groups and regularly alternate the areas in which you plant them to ensure your soil remains healthy and to prevent pests and diseases that like to target a specific host from becoming too much of a problem. But do remember that slow-growing crops such as rhubarb, asparagus and artichokes can remain planted in the same spot permanently. If planted together, certain plant partners can enhance the taste and aroma of a vegetable variety or ward off insects that are a nuisance with their aromatic leaves. Most companion plants are types of herbs that enjoy full sun, fertile soil and sufficient water. However, there are some plants that have a negative effect on each other. Take care of leaf and fruit crops by regularly giving them liquid fertiliser and water. A drip irrigation system, which waters along the soil rather than on the foliage, takes the water to root level and also makes sure the fruits and leaves of plants such as runner beans, which are easily attacked by mildew or mould, remain dry. Regularly remove emerging weeds that will compete with young vegetable plants. A mulch of organic material such as compost, fine bark and straw will also ensure the soil remains loose, moist and free of weeds. Harmful pests and diseases can be controlled with chemical pesticides and fungicides applied at least 10-14 days before you harvest. Organic spray mixtures developed by the likes of Ludwig Taschner and Margaret Roberts are also available at many nurseries, supermarkets and hardware stores. Mediterranean cuisine is some of the tastiest and most popular in the world, and no wonder – the region’s fresh herbs add irresistible, aromatic flavours to food. Basil is probably the most popular Mediterranean herb. Being one of the two main ingredients in pesto, it’s used as a topping for pizza and added to many other popular dishes – but don’t rinse the leaves as they’ll lose their flavour. Sweet basil is a summer annual that needs regular watering, while perennial basil thrives in gardens with minimal frost. Pinch back the stems when they show signs of bud formation because once the plant flowers, the leaves lose their intense flavour – pruning also encourages the plant to grow bushier. Parsley likes sun to partial shade and needs to be watered regularly. Renowned for neutralising the smell of garlic, this versatile herb can also be grown in a formal garden as a pretty edging plant. Rosemary is widely used to flavour meat dishes, and the pretty blue flowers can be used in salads. This waterwise evergreen shrub can grow to over 1m tall and can be pruned to shape. It makes a lovely hedge in formal herb gardens, and does equally well in a container, but give it a sunny but sheltered position in gardens with moderate frost, as it’s not frost tolerant. Chives are a form of wild onion well worth growing, and do more than perk up a pot on the windowsill – they also make an attractive edging plant in a herb garden. More than just a flavouring for various cheese types, chives also add flavour to salads and egg dishes. Sage leaves, chopped or shredded, are used to flavour game dishes, risottos and stews and, when sautéed in butter, make a classic Roman pasta sauce. This waterwise evergreen shrub has woolly greyish leaves; pruning after flowering will keep plants attractive and prevent them from getting too woody and leggy. Oregano is decorative and delicious, sprouting lovely little purple flowers at maturity. The leaves are used to flavour pizza and pasta sauces – harvest them after the plant flowers for best flavour. Bay is a tall evergreen shrub with dark green leaves that are added to pasta sauces, marinades for meat, soups and broths – the leaves also retain their flavour when dried. Plant this waterwise shrub in full sun. If you remove the branches from the main stem, you can train it into a lollipop topiary. Mint species are all perennials with a distinctive scent, and can be used to flavour salads, meat dishes, omelettes and sauces. Though they like sun or partial shade, they will grow well in shady spots – especially peppermint. They like frequent watering and have vigorous roots, so planting mint in a container is a good idea. Varieties include garden mint, peppermint and pennyroyal, and a peppermint tea was long considered the best treatment for stomach ailments. The leaves of all mints can also be rubbed on the temples to ease headaches.